Cucumber is the only redeeming feature in the NeverSeconds blog. Martha, the 9 year old author of NeverSeconds, has shocked the world with photos of her sparse, unappetising school dinners. She has only posted 7 reports so far, and cucumber is one of the few healthy items to be seen on the plate. In 2005 TV launched a series on Jamie Oliver’s School Dinners which highlighted the importance of nutritional school meals. This led to Jamie Oliver’s Kitchen Garden Project which is a is a food education resource development programme. 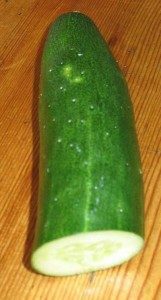 The NeverSeconds blog reminds us that more needs to be done and an increased effort is required to ensure that other fresh vegetables feature along with cucumber.